Persistent increases in health care spending and deficiencies in health care quality are attributable in part to the continued reliance by many health care providers on archaic, paper-based methods of storing and communicating health information. Health information technology (HIT) offers the potential to improve health care delivery and quality, but adoption of these tools by health care providers has been slow. Our review assesses the potential for HIT tools such as electronic health records (EHRs) and regional health information organizations (RHIOs) to meet these challenges, and provides an overview of HIT development efforts in government and the private sector. We conclude that the state should take steps to promote widespread adoption of HIT, and we outline several strategies to achieve that goal. Rising Health Costs Challenge Government and Business. Over the past four decades, national health expenditures have more than tripled as a percentage of the country’s gross domestic product. More recently, since 1990, per capita health expenditures have more than doubled, routinely outpacing overall inflation by significant margins each year. In California, state spending for health programs reflects similar trends. State expenditures for health benefits provided to low-income persons through the Medi-Cal Program rose by over 35 percent between 2000-01 and 2005-06. We project that Medi-Cal spending will grow faster than overall state General Fund spending through at least 2011-12. Also, health coverage premiums for state employees and retirees enrolled in the California Public Employees’ Retirement System (CalPERS) rose by an average of 14 percent annually from 2001 to 2006. The persistent rise in health care spending presents challenges across the spectrum of stakeholders. Fewer businesses are providing health insurance to their employees than before, as reported in a 2006 Kaiser Family Foundation survey that found a decline from 68 percent in 2001 to 61 percent in 2006 in the number of firms nationwide that offer health coverage. The same survey also reported that health coverage premiums increased by 7.7 percent in 2006, an improvement over the 9.2 percent premium increase seen in 2005, but still more than twice the annual employee wage increase of 3.8 percent. Governments at the federal and state levels are looking for ways to maintain or expand publicly-funded health care available through programs such as Medicaid while meeting budget restrictions. Health Care Lagging in Information Technology. Another recent trend is the growing recognition of the discrepancy between the limited use of information technology in health care versus its more extensive use in some other industries. A person can use the same bank card to withdraw money from automated teller machines all over the world, but their potentially life-saving medical information is often accessible to only a few medical office staff who shuffle through paper files. One consequence is that patients today often must provide their medical information repeatedly to different care providers and specialists in the course of receiving treatment. Doctors frequently do not have access to the medical information they need, such as the prescriptions a patient is currently taking, increasing the risks of complications during treatment. Patients themselves often lack sufficient knowledge of their medications, instead perhaps telling the doctor that they take a blue pill for a heart condition and a red one for blood pressure. Under a worst-case scenario, a doctor in an out-of-town emergency room trying to treat an unconscious patient would have no idea what other medical conditions the patient might have or which medications he or she might be taking. This lack of data increases the risks of adverse reactions to treatment or medication that threaten the patient’s safety and drive health care costs higher. Awareness of these sorts of problems increased notably with a 2000 study by the Institute of Medicine, a nonprofit research institution established by Congress. The study reported that medical errors cause between 44,000 and 98,000 preventable deaths in hospitals annually, surpassing motor vehicle accidents, breast cancer, and AIDS as causes of death. These errors result in wasted resources of an estimated $17 billion to $29 billion each year, over one-half of which are for health care costs. Health Information Technology Shows Promise. Against this backdrop, health care providers and payers have recently begun to turn their attention to HIT as a means to improve the quality of health care while holding costs down. Electronically stored personal health information, known as EHRs, show promise of improving the efficiency of health care delivery by providing quicker access to health records and reducing duplicative administrative and care procedures. Greater use of electronic pharmacy prescriptions could help providers avoid administrative delays experienced when a pharmacist is unable to read the doctor’s handwriting on a prescription. Eventually, health information networks (which we discuss in more detail later in this report) may link the data systems of all providers in a region or state together, establishing a seamless network of information across the health care community that enables providers to immediately access a patient’s comprehensive health history at the point of care. This report provides background information on HIT tools, describes current policies at various government levels, assesses the potential for HIT to address certain health challenges in California, and offers recommendations on how to help realize HIT’s potential to improve patient care and control health care costs for the state’s citizens. In this section, we describe (1) the basic terminology for discussion of HIT; (2) potential quality and efficiency benefits of HIT; (3) significant barriers to HIT expansion, such as financing, proprietary ownership of technology, and security and privacy issues; (4) the common data and technology standards being used by HIT systems; and (5) how RHIOs are being organized and sharing information. Health information technology is a broad phrase intended to capture a wide range of technologies and processes related to the electronic generation, storage, and transmission of health information. These include electronically stored information about an individual’s health history; electronic networks for transmitting health data between health care providers; and electronic processing of physicians’ orders, including drug prescriptions and laboratory tests. The nearby box provides a more complete listing and description of terms used in this report. Electronic Health Records (EHRs). These records consist of electronically stored information about an individual’s health history, treatments, and other related information held by a health care provider. An EHR may include information in a variety of forms such as X-rays or computerized scan results, and EHRs of varying sophistication are possible. Some capabilities offered by EHRs include viewing patient medical histories, ordering prescriptions and lab work, and treatment advisory functions. These records are sometimes also referred to as electronic medical records or EMRs. Personal Health Records (PHRs). These electronic records are similar to EHRs but are often limited to information on an individual’s health conditions and treatment history. They may be maintained by the individual, who likely also controls access to the record. 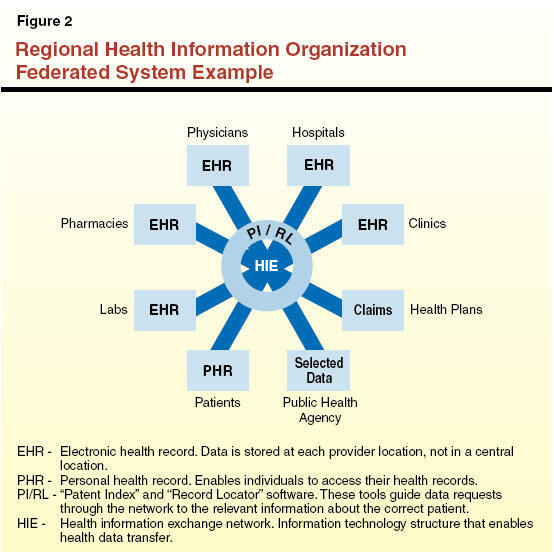 Health Information Exchange (HIE). Data transfer known as HIE is the electronic communication of health information between separate health care entities, such as between a physician’s office and a medical laboratory. Regional Health Information Organizations (RHIOs). A RHIO is a group of health care entities, often confined to a particular geographic area, in which the members typically establish (1) an electronic network for communicating multiple types of health information using standardized information formats and transmission conventions, and (2) rules governing various aspects of the group’s operation, including financing. Such groups may include hospitals, clinics, pharmacies, laboratories, and other health care providers. Electronic Prescribing (eRx). With this technology, electronic devices are used to create, process, and communicate prescriptions for medication. These eRx tools can incorporate functions of varying sophistication. In their most basic form, physicians write and manage prescriptions using a computer instead of a paper prescription pad. More sophisticated varieties can include treatment advice and communication across organizations. This software can be a stand-alone product or may be incorporated into a package of EHR systems or software. Computerized Physician Order Entry (CPOE). These products are clinical information technology tools that physicians and other providers can use to enter orders, such as prescription drugs or lab tests, into a computer system for further patient action. These products are most frequently used in hospitals. Similar to eRx technology, CPOE products were sold as stand-alone tools in the past but are now often incorporated into EHR packages. Clinical Decision Support Systems. These are software tools that assist care providers by offering advice or “best practice” recommendations for a patient’s situation, using information about the individual patient and a database of recommended procedures. These capabilities are now frequently incorporated into EHR, CPOE, and eRx products. More efficient prescription drug processing. Fewer patient burdens, such as repetitive paperwork. These potential benefits are described in greater detail in the nearby box. Fewer Medical Tests. Access to a patient’s electronic health records (EHR) at the point of care through a regional health information organization (RHIO) network would reduce the possibility that a physician would order redundant medical tests. Without such access, a physician would not know whether another physician had ordered a similar test recently. Also, paper records that are lost or located at another facility can result in tests being needlessly repeated at increased cost and inconvenience to the patient. Higher Quality Patient Care. Clinical decision support tools incorporated into electronic prescribing, EHR, or computerized physician order entry systems can alert physicians to potential treatment risks-such as adverse drug interactions, avoiding costly and potentially harmful medical errors. Physicians could receive electronic reminders to take certain standard actions in caring for patients-such as indicating that a diabetes patient is due for a blood test. Improved Emergency Care Outcomes. A hospital emergency room that is linked to a RHIO can quickly access a patient’s medical history to inform decisions at the point of care. Accounting for this information helps the physicians avoid potentially dangerous adverse treatment reactions. More Efficient Prescription Drug Processing. When prescriptions are issued electronically to pharmacies, the pharmacist receives the order almost immediately and can begin filling it prior to the patient’s arrival. Possible confusion resulting from a doctor’s illegible handwriting, a common administrative hurdle with paper prescriptions, can be avoided. Fewer Patient Burdens. Patients in a hospital would not need to repeatedly describe their situation to different doctors and nurses who come to check on them. Instead, up-to-date information in EHR would be available nearby the patient, possibly through a wireless laptop or handheld computer. Also, patients would only need to provide their personal and family medical history once to establish an EHR. From then on, the primary care physician, or other care providers, could access the record through a RHIO and update it, maintaining a comprehensive medical history in one file, rather than in numerous paper files scattered around doctor’s offices, laboratories, hospitals, and other locations. Better Disaster Preparation. Medical histories stored on EHRs would be less likely to be lost during a natural disaster in any particular area, assuming that appropriate precautions were taken to back up electronic records. For instance, a fire or earthquake that destroyed a physician’s office might not result in the loss of that practice’s records if that physician participated in a RHIO. If the practice kept all its records onsite in paper folders, all records could be lost in such an event. Increased Public Health Monitoring. Public health monitoring would be improved by the ability to review diagnostic information on a confidential basis from a wide variety of patients. Trends in disease and other medical conditions could be detected faster and, thus, addressed more rapidly. Despite the acknowledged potential benefits of HIT systems, adoption so far has been limited. 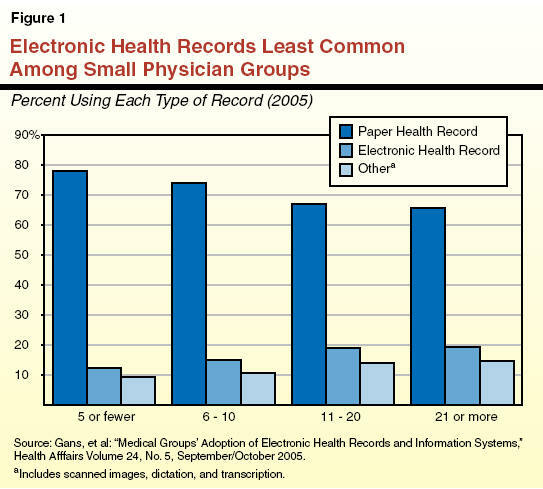 Only an estimated 15 percent of physicians nationally use EHRs, and small medical practices are less likely to have implemented EHRs than larger practices, as illustrated in Figure 1. Communities with RHIOs under development or in operation number perhaps in the low hundreds nationally, with most of these in some stage of development short of actually implementing a health information exchange (HIE). A variety of factors have slowed the wider adoption of HIT. Lack of financial resources is one frequently cited barrier to greater implementation of these new systems, but other notable factors include the challenge of transitioning to an EHR-based practice as well as proprietary and privacy concerns. We discuss each of these barriers to HIT in more detail below. Financing Remains Elusive. The relatively high cost of implementation has inhibited the adoption of both EHRs and HIE. According to a 2005 survey conducted by the eHealth Initiative (eHI), a nonprofit organization that promotes HIT nationwide, 32 percent of groups seeking to establish HIE indicated that securing start-up funding was a moderately difficult challenge, with 59 percent reporting this as a very difficult challenge. Establishing a “sustainable” business model (in which business revenues or savings from use of the new technology would be sufficient to offset its additional cost) was described in this survey as either very difficult or moderately difficult by 84 percent of groups seeking to establish HIE. We discuss the costs of EHRs for individual practices later in this report. Transition to EHRs Presents Challenges. Use of EHRs as an integral part of a medical practice typically requires different administrative processes than those associated with paper records. In addition, new hardware and software could require comprehensive rearrangement of operating procedures. At a minimum, patients’ medical histories have to be entered into the EHR system, at least to some extent, creating additional workload. As physicians and administrative staff learn to incorporate EHRs and possibly RHIOs into their business, they temporarily may be unable to care for as many patients. For some providers, this decrease in patient volume could result in a loss of revenue in addition to the stress of changing familiar patterns of work. One detailed account of EHR adoption by a small primary care practice reported decreased patient scheduling, longer patient wait times, and high levels of workplace stress for about three months following implementation. However, the practice ultimately achieved improved patient wait times and improved staff morale. Lack of Interoperable Products Prevents Sharing of Health Data. A significant barrier to establishing HIE partnerships and RHIOs has been a general lack of interoperability among the variety of HIT products that have been available. These products were developed with proprietary formats by competing vendors, which means that an EHR created in one software program may not be easily accessed through a different software program. Although some technology standards are emerging now, as discussed in the nearby text box, marketplace conditions and incentives generally have not emerged to create widespread standardization of HIT tools. As a result, even the relatively few health care providers who now have EHRs might need to commit significant additional resources to be able to share EHRs with other organizations in their health care community. According to a report by the technology research firm Forrester Research, the costs to integrate computer systems across organizations will be substantially greater than the costs to purchase those HIT software and hardware systems. Various data and technological standards currently in use are proving integral in the development of “interoperable” health information systems capable of effectively sharing health data included in electronic health records and electronic prescribing. We highlight below two main types of standards. Terminology Standards. One main type of standard lays out a common set of medical terminology for a particular area of health care, in order to help ensure that all information users understand one another. An example of this type of standard is called the Logical Observation Identifiers Names and Codes (LOINC), which provides uniform terms and codes for laboratory testing procedures. The 2005 eHealth Initiative (eHI) survey mentioned earlier reported that 41 percent of health information exchange respondents that had begun implementation were using LOINC terminology to share information on laboratory tests. Computer Standards. Another main type of standard spells out the uniform technical specifications that allow different computer systems to communicate accurately among one another. One popular standard in this category is known as Health Level Seven (HL7), a “messaging” standard that allows users to know who is sending and receiving the information and which patient the information describes. The eHI survey reported that 76 percent of respondents that had begun implementation used HL7. Information Security and Privacy-Significant Concerns. Concern over the security and privacy of health information is also regularly cited by experts in news and research reports as a key challenge for the development of HIT systems. Holding a large volume of personal information in an electronic format inherently creates a risk that one breach of information security could generate widespread risk or damage to the privacy of patients. The recent well-publicized incident involving a security breach of personal records maintained by the U.S. Department of Veterans Affairs (VA) demonstrates the high level of public concern about such security and privacy issues. In that case, a laptop computer with millions of veterans’ personal identification information was stolen. While the incident did not specifically involve EHRs or RHIOs, and no health information was lost, these new HIT technologies plausibly create similar risks. In a 2005 national survey of American consumers funded by the California HealthCare Foundation (CHCF), a philanthropy that supports health care improvement through a variety of projects, two-thirds of respondents reported being very concerned or somewhat concerned about the privacy of their personal medical records. A majority of those surveyed thought that computerization would benefit the health care industry, but they were modestly less confident in the security of electronic health information relative to paper records (although a majority felt that each would be secure). The federal government has established some requirements for the security and privacy of electronic health information as part of a 1996 law known as the Health Insurance Portability and Accountability Act (HIPAA). The HIT systems must be developed in compliance with HIPAA privacy and security rules. Generally, HIPAA permits information to be shared among providers for purposes of rendering care, implying that many HIE activities are permissible. However, it is not yet clear how the HIPAA rules apply to some of the potential new data-sharing practices associated with these systems. The RHIOs can differ significantly in how they are organized and governed, and in how they share information. We discuss some of these key differences below. Governance Increasingly Formal. Some RHIOs are developing as informal collaborations among participating health care entities within a region. At the other end of the spectrum are formal, legally established RHIOs organized as either nonprofit or for-profit corporations. The eHI’s 2005 survey mentioned earlier indicates that groups operating RHIOS are tending to become more formally organized. For example, the 2005 survey reports that 44 percent of survey respondents indicated that their RHIOs are incorporated, up from 29 percent of those who responded to eHI’s 2004 survey. Point-to-Point Systems. In this category, health care providers share patient data with one another on an ad hoc basis as agreed by the parties. There is generally no shared database or established network among multiple entities for this purpose. This is how much of the health industry operates today, using paper medical records. Federated Systems. Under this approach to sharing medical data, each participating health entity, such as a doctor’s office, hospital, or lab, stores the data pertaining to its patients on its own separate computer systems. These individual systems are then linked by a computer network that allows users to search for health records on each of the other systems using patient indexing and record locator software. Each participating health entity can maintain different computer programs at its own location as long as those programs can communicate with each other. An example of a hypothetical federated RHIO is shown in Figure 2. Centralized Systems. Under this approach, all patient and clinical data is stored on one central database that is accessible to all participants. Individual health entities would ”upload” patient information to the central database. Each participating entity would have to adopt computer programs that were technically compatible with the central database. Hybrid Systems. This approach combines the advantages of the federated and centralized systems. Some patient data would be stored on a centralized database that integrates information from participants into a uniform format at a central location. Some information would continue to be stored on the computer systems of participants, which could still be linked as in the federated model. Various federal efforts to promote broader use of HIT and the development of RHIOs have been initiated in the past two years. These include (1) administrative actions by the U.S. Department of Health and Human Services (HHS) and (2) legislative proposals now being considered by Congress. We discuss these activities in more detail later. Additionally, the federal government has achieved what many experts consider to be a highly successful EHR system in the VA, which we discuss in more detail in the nearby text box. The U.S. Department of Veterans Affairs (VA) health system is the largest single health care system in the country. Its 1,400 hospitals and other health facilities participate in a network that allows clinicians to access patient electronic health records (EHRs) available from other VA facilities. Images including X-rays, photos, and other documents are available through the network. Adoption of HIT has been credited with playing a significant role in the transformation of the VA from a provider of substandard care in the early 1990s to an institution that outperforms most private hospitals in HIT adoption and, by some measures, in general care quality and efficiency. VA Leading in Quality. For six years in a row, VA hospitals have outperformed private facilities in quality of care, according to a patient survey conducted annually by the University of Michigan. A 2004 RAND Health study comparing the VA with other health providers concluded that VA patients were more likely to receive recommended care and that quality of care for VA patients exceeded that of other patients in 14 out of 15 categories of assessment. VA’s EHR System Mitigated Effects of Natural Disaster. The VA’s EHR system demonstrated its advantage in coping with natural disasters. Hurricane Katrina destroyed the VA Medical Center in Gulfport, Mississippi, and caused the evacuation and closure of the New Orleans VA Medical Center. Nonetheless, health records for the 40,000 veterans in the area were quickly available at other VA health facilities around the country due to the VA’s HIT capabilities. VA Software Now Available to Physicians. In September 2005, the VA made available to physicians a version of its EHR software, VistA, that had been redesigned to work in private physicians’ offices. Physicians must pay licensing and installation costs to use VistA-based products, but the software is potentially less expensive than commercial alternatives. The current federal administration issued a call in 2004 for the development of a national health information infrastructure within ten years. Since then, the Bush administration has launched a variety of projects to develop a comprehensive HIT policy approach and to assist health care providers in adopting their own HIT systems. Below are several key examples of such actions. New Entities Established to Set Policy Direction. In 2004, the Bush administration established the Office of the National Coordinator for Health Information Technology (ONCHIT) within HHS. The ONCHIT is intended to lead HHS’s HIT activities and coordinate the administration’s overall approach to HIT policy. Additionally, HHS convened a new federal advisory committee called the American Health Information Community (AHIC), comprised of leaders from government and industry, to provide input on HIT implementation issues. Regulatory Changes to Facilitate HIT Adoption. The federal Centers for Medicare and Medicaid Services (CMS), the lead federal agency for those two major health care programs, and the HHS Office of the Inspector General issued new regulations in August 2006 that are intended to facilitate HIT sharing among health care organizations. Currently, federal antikickback laws seek to prevent improper compensation arrangements between physicians and other providers, such as hospitals. The new regulations establish or clarify “safe harbors” in which sharing HIT does not violate these laws. For example, one exception established by CMS sets up certain conditions under which a hospital could provide electronic prescribing (eRx) hardware or software to a physician who could refer patients to the hospital without running afoul of the antikickback rules. Health Agency Grants for HIT Development. In 2005, HHS funding awards included about $36 million in grants to public and private organizations to focus on four specific areas of HIT development. “Harmonizing” HIT Standards. A grant of $3.3 million to the American National Standards Institute will support efforts to develop and evaluate a process for harmonizing existing standards for HIT in order to permit systems to share information much more easily and more widely. Certification of HIT Systems. A wide variety of HIT products are available in the marketplace, but there are limited means for certifying what these products can do or how well they can communicate with one another. The Certification Commission for Health Information Technology (CCHIT), a voluntary certification body created by three private HIT industry associations, received a grant of $2.7 million from HHS to help put such a certification system in place. Specifically, CCHIT is developing criteria to evaluate EHRs and the networks that can connect HIT systems. In July 2006, CCHIT issued its first round of certifications, announcing that over 20 EHR products met its criteria for outpatient clinic EHRs. The CCHIT also intends to develop certification standards for hospital and health plan inpatient EHRs and the networks through which HIT products can share information. Health Information Privacy and Security. Health care providers and other organizations have adopted additional policies and standards to protect the privacy and security of health records. The HHS awarded a grant of $11.5 million to RTI International, a nonprofit research organization, to assess the health information privacy and security laws and practices of different states and business organizations and how they vary. In California, the nonprofit organization CalRHIO and the California Office of HIPAA Implementation (CalOHI), which is part of the state Health and Human Services Agency, are leading this project. Nationwide Health Information Network. The HHS has awarded $18.6 million in contracts to develop four prototype RHIOs connecting disparate areas of the country. We provide more detail on the status of this effort later in this report. Additional Administration Activities to Promote HIT. A variety of other federal administration efforts are underway. For example, the National Institutes for Health, the primary federal agency for conducting medical research, is also operating grant programs related to HIT systems. Additionally, grant funds totaling $150 million over two years have been made available for innovative improvements in state Medicaid programs (known as Medi-Cal in California). The funds were made available under the recently enacted federal Deficit Reduction Act, which specifically cites HIT as a permissible use for the funds. Further, the U.S. Agency for Healthcare Research and Quality (AHRQ), a research arm within HHS that focuses on improving health care, is also providing grant funding and expertise to promote the development and adoption of new HIT systems. California organizations have received AHRQ grants for projects including establishing an Internet-based diabetes registry in Santa Cruz County and evaluating the usefulness of HIT in rural settings. Members of Congress proposed a number of bills during the 109th Congress to promote the adoption of improved HIT systems for general care delivery, although none were passed into law. These included measures to provide additional funding for HIT development or to promote uniform standards for HIT systems. Of these bills, S. 1418 and H.R. 4157 were each approved by a full vote in one of the houses. The Senate passed S. 1418 in late 2005, and the House of Representatives approved H.R. 4157 in July 2006. Both bills would have set up HIT subsidy programs, established ONCHIT and AHIC in federal statute, and enacted a variety of other similar provisions. However, H.R. 4157 also included a requirement not strictly related to HIT adoption, namely, the establishment of a significantly expanded set of medical billing codes. The Congress did not reconcile the differences in these two bills before the legislative session ended. Some estimates indicate that there are more than 100 RHIOs around the country. However, reports to date suggest that the vast majority of these are still in the planning stages, and that relatively few RHIOs have actually commenced the full-scale practice of sharing health information electronically. In this section, we discuss private and government-supported efforts to establish RHIOs and the success of these efforts to date. Many RHIOs at this time rely on grant funds to cover operating costs. However, some RHIOs that have focused more narrowly on certain types of HIE capabilities are now able to support their operations with their own revenue instead of grant funds. We provide information below on some notable efforts supported mainly by the private sector to adopt EHRs and eRx and to develop RHIOs and HIE. Indiana Health Information Exchange (IHIE). The IHIE is a nonprofit corporation that started in February 2004 from a collaboration of 13 health care organizations, including hospitals, providers, public health organizations, and researchers. The first available service through IHIE was a messaging system by which doctors could receive the results of patients’ tests like X-rays or laboratory tests electronically. Health providers and other organizations that generate the data, such as laboratories, pay fees to send these clinical reports electronically at about one-half the cost of sending paper-based messages. Physicians receive the electronic messages free of charge. The IHIE also operates an EHR system that links 18 different hospitals within Indianapolis. This means emergency room physicians can gain immediate electronic access to the medical histories of a patient who may appear in the emergency room, regardless of which hospital in the city may have previously served that patient. This access to EHRs is reported to be particularly useful in the treatment of patients who arrive in an emergency room unconscious or unable to speak. HealthBridge. Based in Cincinnati, the HealthBridge information network links together 18 hospitals connecting thousands of physicians, nursing homes, independent laboratories, and radiology centers in its community. HealthBridge provides clinical messaging services in which laboratory, radiology, transcription, and health information can be transmitted. Some hospital inpatient records can also be accessed via the HealthBridge network. HealthBridge is notable in part because of its longevity and independence-it began in 1997 with virtually no government funding. Prescription Drug Networks Have High Participation. Two networks specifically targeted to the prescription drug market have emerged with high rates of participation among pharmacists. Although they share data for only one type of service (prescription drugs), these networks demonstrate that HIE can be established in a form that includes many participants. SureScripts, founded by two major national pharmacy associations, claims that up to 85 percent of pharmacies nationwide are linked to its network and that 45 percent of its participants accept electronic prescriptions. The other network, RxHub, is a joint venture of the country’s three largest pharmacy benefit managers (PBMs). RxHub transmits eligibility, benefit, and medical history information from these three PBMs to physician offices at the point of care. Physicians also can use RxHub to send electronic prescriptions to the PBMs’ mail-order pharmacies. While privately organized HIE efforts are the furthest along in development to date, a few government-organized efforts supported by federal agencies and some states are also now underway. We discuss these efforts later. Federal Prototypes to Test Cross-Country Networks. As noted earlier, the HHS has provided federal grant funding for the development of four prototype RHIOs through its National Health Information Network project. Each group will establish prototype networks among hospitals, laboratories, pharmacies, and physicians. Additionally, the four prototype networks are intended to establish systems that can communicate with one another. Once the projects are completed, the design for these networks is to be made public to stimulate further innovation and development of such electronic systems. Among the health care markets selected to participate in these projects are Mendocino, which is to participate in a network with providers in Indiana, Massachusetts, and Santa Cruz, which has been included in an effort with Cincinnati and Cleveland, Ohio. Some State Government Programs Under Way. A few state governments are also playing a more significant role in funding or organizing RHIOs. In its most recent survey, eHI found that at least ten governors have issued an executive order related to HIT promotion and that 22 state legislatures have passed bills related to using HIT for health care improvement. Some examples of these state activities are shown in Figure 3. Administers grant program to award funds in three categories: Assessment & Planning, Operations & Evaluation, and Training & Technical Assistance. Provided grant funding to support 26 regional health network projects. Most recent state budget includes bond funds to help develop a statewide health care information system. Provided start-up capital to develop a three-county HIE under the Volunteer eHealth Initiative launched in July 2004. Because so few private and public organizations have completed the process of adopting and implementing these new HIT systems, only limited information is available on the results of these efforts to date. What information is available suggests that, while the results to date are not unanimous, HIT has a clearly demonstrated capability to deliver improvements in health care quality in some health care settings. In 2003, the U.S. Government Accountability Office (GAO) reported improvements in the quality of care such as shorter hospital stays, quicker communication of test results, and better management of chronic diseases for patients. For example, one provider realized a 20 percent increase in the number of diabetes patients whose conditions were under a high level of control. A survey published in the health journal Annals of Internal Medicine reviewed more than 250 studies of various HIT efforts (conducted primarily at four academic health care institutions), finding support for three different types of quality benefits: improved adherence to recommended care guidelines, improved surveillance and monitoring of patient conditions, and reduced medication errors. A leading nonprofit hospital in Brooklyn, New York, reported a 30 percent decrease in average inpatient length-of-stay and decreases of 41 percent to 49 percent for certain diagnostic laboratory tests following implementation of an internal EHR system. Studies of the financial effects of HIT indicate that savings can result from adoption of various HIT tools. However, the financial benefits do not accrue evenly to all participants in the health care delivery process. Payers such as health care plans appear to reap most of the financial benefits, while care providers, such as hospitals or physicians, typically bear most of the costs of HIT implementation. Even so, health care providers have seen financial rewards, but these results are more inconsistent. Potential for Nationwide Savings. Some researchers have estimated that the United States health system as a whole, including both public and private sectors, would yield better care at lower costs if supported by networks of health information. A 2005 report by RAND, a nonprofit research institution, estimated that the U.S. could establish a comprehensive network of EHRs over 15 years. RAND projected that the average annual implementation costs over this period of $8 billion would be more than offset by average savings of $42 billion each year, resulting in average annual net savings of $34 billion. RAND estimates gross savings would be $77 billion annually following implementation, with additional savings possible by using such a network for preventive care and management of chronic conditions. Some critics contend that such predictions rely on possibly unrealistic assumptions about the ability of health care organizations to incorporate HIT into their operations. They also note that the estimated savings amount to less than two percent of the nation’s annual projected health spending in 15 years. HIT Efforts Show Fiscal Benefits for Some Hospitals. There are some preliminary indications that use of EHRs is providing net financial benefits to some hospitals that have implemented them. For example, Brigham and Women’s Hospital in Boston, Massachusetts, estimated it achieved net savings of $5 million to $10 million per year following installation of a computerized physician order entry system that reduced serious medication errors by 55 percent. The GAO review previously mentioned described a variety of financial benefits realized by the entities in the study. A large hospital included in the report generated about $8.6 million in annual savings by replacing paper medical charts with EHRs for outpatients and about $2.8 million annually by establishing electronic access to laboratory results and reports. However, the GAO report focused on organizations that were successful in implementing HIT; it did not analyze results for any entities that may have attempted to adopt HIT without success. Some Positive Effects for Small Providers. Some evidence regarding the experience of smaller health care entities with EHRs is also available. A study of the effects of EHRs in primary care settings published in the American Journal of Medicine estimated net benefits from EHR use of over $86,000 per provider over a five-year period. A case study of small physician practices by the University of California, San Francisco, reported an initial investment for computer training, software, and hardware for these groups ranging from $37,000 up to $64,000 per physician. The study reported that most of these medical practices experienced net financial benefits within several years, primarily as a result of efficiency gains and increased billing. The time needed to recover the initial expenditure for the EHRs averaged two and one-half years, although 2 of the 14 practices studied appeared unlikely to ever recover their initial investment. Practices with less pre-EHR technical experience tended to have higher implementation costs, reducing their net financial benefits. In California, a variety of HIT activities are now underway, comprised so far mostly of local and private efforts. However, state officials have recently begun to take steps to promote and develop HIT systems in the state. CalRHIO. CalRHIO is a nonprofit organization seeking to develop HIE and RHIOs in California primarily through coordination, research, and education. Among its various projects is an effort to establish HIE among the state’s emergency rooms. Lumetra. Lumetra is a nonprofit health consulting organization that provides a range of services to clients in the public and private sectors. Under a contract with CMS, Lumetra led a pilot project involving four states to make HIT training resources available free of charge to Medicare providers. Through this program, which CMS expanded nationwide in 2006, Lumetra provides online training and personal assistance to teach California physicians how to select and use EHR software. CHCF. The CHCF supports a wide variety of health care projects in California through research, education, and funding. Among its various HIT development activities, CHCF is leading an effort to promote the adoption of its laboratory data exchange standard called ELINCS. Some HIE Development Underway. Various efforts to develop HIE among members of a health care provider community are underway around California. These differ in planned scope and organization, but none yet represents a fully operational RHIO. Three such efforts are the Securing Health Access and Record Exchange in Mendocino County, the Santa Cruz RHIO, and the Santa Barbara County Care Data Exchange, which we discuss further in the nearby text box. The SBCCDE consists of nine regional health care entities, including hospitals, health plans, clinics, labs, pharmacies, and the county public health department. The SBCCDE relies on the federated model of data sharing, which it believes will hold costs lower than a centralized model and better ensure the security of medical records. However, SBCCDE also employs a central “patient index” to provide easier access to patient records. Part of the original funding for SBCCDE was provided by the California Healthcare Foundation in the late 1990s, but various legal and organizational issues have delayed full implementation of this regional health information organization. Physicians are now being trained on how to use the system, but data sharing had begun at only a few larger care facilities at the time this report was prepared. Additionally, recent discussion with some SBCCDE participants indicates that ongoing funding for the project is now uncertain as a result of the various delays. Corporate HIT Activities. Several large California health care plans and hospital chains are also in the process of implementing EHRs or HIE within their organizations. The health care plan WellPoint has reported plans to make personal health records (PHRs) available to members and to provide electronic access to clinical data on WellPoint members for emergency departments. Blue Shield is reportedly establishing PHRs for its own employees as a pilot program to evaluate the possibility of making such records available for members. Kaiser Permanente, a comprehensive health plan and care delivery system, has already implemented EHRs and eRx at many of its care facilities as part of an ongoing project to employ such tools throughout its network. Governor Issues Executive Order for HIT. In July 2006, the Governor issued an executive order with the stated goal of achieving full information exchange between health care providers and stakeholders within ten years. The order (1) directs administration officials to allocate at least $240 million for this purpose to certain health care organizations, (2) calls for the development of public-private financing alternatives to expedite HIT adoption, and (3) establishes an “eHealth Action Forum” to develop a statewide agenda and comprehensive HIT program by July 2007. The eHealth Action Forum, a meeting of experts convened by the secretaries of the Health and Human Services Agency; the Business, Transportation, and Housing Agency; and the State Chief Information Officer, met in October 2006 to discuss ideas for the state’s HIT policy. The $240 million discussed in the executive order is held by UnitedHealth Group, a major operator of health care plans. (We discuss these funds further below.) UnitedHealth acquired PacifiCare Health Systems, a health care plan, in December 2005. In order to obtain regulatory approval for this merger from the California Department of Insurance (CDI) and the state Department of Managed Health Care (DMHC), UnitedHealth agreed to spend $250 million for various projects to improve health care in California. Under the terms of the merger agreement, UnitedHealth must spend the funds in consultation with CDI, DMHC, and members of an advisory committee. The agreement does not provide a direct role for the Legislature in allocating the funding. The UnitedHealth funds consist of two pools of money: First, $50 million was available for various grant or subsidy purposes including technology improvements for safety net providers, medical education programs in underserved areas. Second, the remaining $200 million was limited to investment-grade uses benefiting entities that care for underserved populations and have difficulty accessing capital. Over $10 million of the smaller pool has already been spent, primarily for medical education purposes. The administration has not provided a specific proposal for using the remaining $240 million to expand HIT efforts in California. Establishing a Deputy Secretary of HIT and a State HIT Financing Advisory Committee to coordinate the state’s HIT-related efforts and develop financing mechanisms. Implementing universal eRx by 2010. Developing a standardized PHR within the public and private sectors. Implementing a county-level pilot electronic medical record system for mental health patients within the requirements of Proposition 63, the Mental Health Services Act, which California voters approved in the November 2004 general election. Administration Seeking Federal HIT Grant. The California Department of Health Services (DHS) indicates that it is applying for a grant under the federal Deficit Reduction Act to help develop the state’s HIT capabilities. The department indicates that, with assistance from CalRHIO, it sought $11 million over two years to support a pilot project for certain community clinics and hospital emergency rooms serving Medi-Cal patients in three selected areas of the state. This project would grant these providers access through the Internet to the Medi-Cal prescription data held by the pharmaceutical networks SureScripts and RxHub, described above, as well as diagnostic laboratory data. The DHS did not receive any funds in the first round of grant awards, announced in January, but can apply for a second round of funding to be awarded later in 2007. State Legislature Has Considered Several HIT Bills. Lawmakers considered several HIT bills during the 2005-06 legislative session, including one that was signed into law. Chapter 698, Statutes of 2006 (AB 225, Negrete McLeod) conforms state statute to federal law by establishing safe harbors for the sharing of electronic prescribing technology between certain health care providers. These provisions would be limited to drugs covered under Medicare Part D, the prescription drug benefit for Medicare participants. SB 1338 (Alquist)-Would have required the California Health and Human Services Agency, in conjunction with certain other state departments, to develop a strategic plan to foster the adoption of HIT. This plan would have included, among other provisions, HIT standards and identifying incentives to promote the use of EHRs and PHRs. AB 1672 (Nation, Richman)-In an early version, would have established deadlines for various health care entities to adopt EHRs, provided enhanced Medi-Cal reimbursement for EHR adoption, and provided state funding to promote HIT development. CalPERS Considering HIT Issues. This system purchases health care for more than 1.2 million state and local government employees, or about 4 percent of insured Californians. Annual health care premiums for CalPERS members total $4.3 billion. Discussions with CalPERS staff indicate that it has begun to consider means by which it could help its members benefit from HIT, but at this stage it has not developed any specific strategies to do so. Medi-Cal Would Likely Benefit From HIE. Currently, the Medi-Cal Program does not include any mechanisms to directly finance or encourage its network of medical providers to undertake HIE efforts. Our review of the benefits of HIE indicates that Medi-Cal, California’s version of the Medicaid program, would benefit significantly from the broad development of HIE networks. Roughly 70 percent of its costs to the state are for fee-for-service care, in which beneficiaries may seek care from Medi-Cal providers of their choosing with no coordination through a primary care physician. Fee-for-service thus has a high potential for duplicative testing and poor access to patients’ health history among different providers. The point-of-care access to health information available through RHIOs could equip physicians to provider better care while eliminating the need for Medi-Cal beneficiaries to repeatedly complete medical paperwork. Savings to the state would be possible across a variety of services, including hospital inpatient and outpatient, pharmacy, laboratory, and disease management services. For example, a reduction in Medi-Cal’s average hospital stay of 15 percent, or one-half the 30 percent reduction in length-of-stay in the Brooklyn hospital example noted previously, would generate General Fund savings of nearly $300 million annually. If certain other savings results could be replicated by the program, savings or cost avoidance to state health programs could eventually reach the hundreds of millions of dollars annually. Other State Programs Also Stand to Benefit. In addition to Medi-Cal, the state provides health care and related services through several other programs that would likely benefit from widespread HIT adoption. For example, the Healthy Families Program, operated by the Managed Risk Medical Insurance Board (MRMIB) contracts with various health care plans to provide coverage for over 800,000 low-income children. The state Department of Mental Health (DMH) provides for the delivery of mental health services through a state-county partnership: A broad array of treatment and rehabilitative services are provided for clients with mental illness, and children and youth with serious emotional disturbance. Mentally ill would, in some cases, benefit from the comprehensive approach to health care that would result from enabling mental health care providers to access health data held by their patients’ physical health care providers, and vice versa. Additionally, access to EMRs could help reduce health care costs for the California Department of Corrections and Rehabilitation (CDCR), whose inmates transfer from receiving care in the private sector to the prison system often with delayed access to medication history and other information. Adoption of HIT has demonstrated benefits to health care quality and efficiency within numerous individual organizations, and the broad exchange of health information through RHIOs promises additional improvements. Although risks accompany HIT implementation efforts, our review indicates that Medi-Cal and CalPERS would likely benefit eventually from the broad development of RHIOs and HIE around the state. However, it remains unclear which specific HIT systems and approaches will ultimately improve the quality of health care and prove to be cost-effective. Given this situation, we recommend that the state’s role, at this time, be to support the development of HIT in the state without imposing restrictions that prematurely promote the development of particular technologies or products, instead leaving those matters to be resolved by competition in the HIT marketplace. For this reason, we also recommend, at this time, against requiring health care providers to adopt HIT in order to participate in the state’s major health care programs, such as Medi-Cal or CalPERS. Doing so at this early stage creates a risk that the state might discourage providers from continuing to participate in Medi-Cal or force them to undertake HIT projects that might prove unsuccessful. We believe a better approach for the state now is to provide incentives to encourage voluntary expansion and experimentation with HIT within California generally and within the state’s major health care programs. We believe such a voluntary approach would work in partnership with health care providers and would involve less risk to the state. Should policies to encourage voluntary HIT adoption eventually prove to be insufficient, the Legislature could consider additional policies at a later date. These could include mandating that providers share their health care data with an available local HIE organization or adopting selected data-sharing formats and requiring their use by providers in the state’s major health care programs. Below we outline more specific strategies for the Legislature to consider that are consistent with the approach discussed previously to foster the development and expansion of HIT within California. As discussed earlier, financing is a major obstacle for health care organizations interested in adopting EHRs. Smaller medical practices in particular tend to lack the funding to purchase EHRs and the operational flexibility to make the transition to operating an EHR system. Our analysis indicates that Medi-Cal and other state health programs could be used as vehicles to support HIT development through a combination of loans, grants, training, and innovative reimbursement methods. Given the General Fund shortfall facing the state over the next few years, the state should first seek funding sources other than the General Fund to support these strategies, as we discuss further below. For instance, although the UnitedHealth funds are not under direct legislative control at this time, the Legislature could pass legislation directing CDI and DMHC how to proceed in their roles as advisors to UnitedHealth on the use of those funds. Establish Loan Program for Medi-Cal Providers. In our view, SB 1672 (Maldonado), considered but not passed during the 2005-06 legislative session, offers a sound approach for using low-interest loans to reduce EHR acquisition costs for health care providers. As proposed in SB 1672, these loans would come from an existing revolving fund operated by the California Health Facilities Financing Authority (CHFFA). Thus, additional state General Fund resources would not be needed for such a program. The CHFFA reports that the balance available for loans through a similar existing loan program had grown to $22 million as of November 2006. The state should target HIT loans to Medi-Cal providers under a selected size in order to serve those least able to obtain financing on their own. Appropriate limits on the size of loans would help to manage the size of the program. Also, loans should be limited to a certain set percentage of the acquisition costs and first-year service costs of the EHR package (perhaps two-thirds of the total) in order to ensure that only committed providers obtain loans. We recommend that any such loan program be limited to financing of HIT systems that would be widely interoperable and meet standards or product certification to ensure this result. Some portion of the $200 million pool of UnitedHealth funds allotted for investment purposes may also be available for this purpose, depending on UnitedHealth’s investment criteria. Create New Medi-Cal HIT Reimbursement Methods. Physicians who implemented EHRs have reported significant disruptions to work processes and patient volumes during transition to the new systems, resulting in loss of revenue. In order to mitigate the one-time financial burden associated with the transition to new HIT systems, we recommend that the Legislature authorize Medi-Cal to establish short-term rate augmentations to reimburse providers for HIT implementation activities. Under this method, providers that implement targeted HIT capabilities, such as eRx or electronic sharing of laboratory results, would receive a certain percentage increase in the rates paid for selected services. We recommend that these increased reimbursement rates be available only to providers that meet certain minimum requirements, similar to those discussed previously for loans. By compensating providers for HIT adoption through Medi-Cal billing rates, the state would obtain Medi-Cal’s standard dollar-for-dollar federal funding match, which would not likely be available by using the funds for grants. A portion of the $40 million in UnitedHealth funds could be transferred to the General Fund to provide the state match necessary to draw down the federal funds. Provide Grants for RHIO Development. Significant benefits from HIT will only be realized once communities of health care providers in a region enable broad and efficient sharing of patient information. Accordingly, we recommend that the Legislature establish a program to provide one-time grants to organizations seeking to develop RHIOs or other forms of HIE. Several features of a grant program operated by the State of Florida would appear likely to benefit California. Florida provides such grants only to projects that agree to establish HIE between at least two competing provider organizations. Florida also requires a 50 percent funding match by the grantee, which would ensure that the grantees were invested in the success of the project. A portion of the $40 million pool of UnitedHealth funds available for grants could be employed in this manner, and it may be possible to obtain federal grant funds for this purpose as well. Develop Training Opportunities for Providers. The lack of resources and experience to support a HIT implementation project can be a significant obstacle for providers, particularly smaller providers who tend to lack dedicated information technology staff. Training in the use of EHRs could help to reduce this challenge. As noted earlier, the California nonprofit organization Lumetra provides free EHR training to Medicare providers as part of its federal contract. While Medi-Cal providers are likely to also serve Medicare patients, Lumetra’s program is limited to a few hundred physician practices and is already at capacity. Additionally, the American Medical Informatics Association, a nonprofit organization that promotes the use of health technology, has established partnerships with universities to provide short-term Internet-based training courses in HIT. We recommend that the state establish a contract with organizations such as these that would be targeted at Medi-Cal providers in smaller practices. A portion of the $40 million pool of UnitedHealth funds available for grants could be used for this purpose, and federal grant funds may be available as well. The state could use its influence as a significant purchaser of health care services to promote the use of HIT. Seek HIT Marketplace Discounts for Medi-Cal Providers. As a further means to reduce the financial barriers to HIT adoption, particularly among small providers, we recommend that the Legislature direct Medi-Cal to seek bulk discounts on EHR products for its providers. Medi-Cal provides health care for 6.6 million beneficiaries, or 22 percent of Californians with health coverage. Using its power in the health care marketplace, the state could obtain significant discounts for individual medical practices that otherwise would be left paying full price for new HIT systems. In order to avoid “picking a winner” among the HIT marketplace competitors, the state should seek discount commitments from a range of vendors, all of whom would need to meet certain thresholds for data interoperability. Medi-Cal providers would still purchase HIT tools directly from vendors; the key role for the Medi-Cal Program is to negotiate on their behalf. Our proposed approach allows the state to reduce some of the fiscal barriers to HIT adoption without directly spending its own funds. Monitor HIT Activities of CalPERS. The CalPERS represents another opportunity for the state to use its influence in the marketplace to promote the development and expansion of HIT systems. Specifically, we recommend that the Legislature require CalPERS to report by May 1, 2008, on its efforts with respect to HIT and on the costs and efficacy of requiring its contracting health plans to make PHRs available to CalPERS members. Additionally, the Legislature should eventually require health plans contracting with CalPERS to make PHRs and EHRs available to CalPERS members and to participate in RHIOs where available. A recently proposed (but not enacted) bill in Congress, H.R. 4859, would require plans contracting with the Federal Employees Health Benefits Program (the federal equivalent of CalPERS) to make EHRs and PHRs available to their members. House Resolution 4859 would also require these contracting health plans to establish incentives for their health care providers to adopt EHRs, subject to the availability of federal grant funds for that purpose. Initially, however, for the reasons discussed previously, we recommend a voluntary approach that encourages, rather than requires, such actions by health care plans. The HIT marketplace continues to develop at a rapid pace, and the efforts to establish HIE networks still have not demonstrated which are the best and most sustainable operating models for sharing health information. In order to maintain a state HIT policy that can adapt to possible marketplace innovations, we recommend that the state take an active role in partnership with the private sector to coordinate HIT policy. Establish Advisory Body. First, we recommend that the Legislature enact legislation to expand CalOHI’s role to include leadership of an ongoing public-private body to assess the progress of RHIO development in the state and make recommendations for additional actions to coordinate data sharing efforts. Such a body could play a role similar to that proposed by SB 1338 for the California Health and Human Services Agency, which would have led a stakeholder group in developing a strategic plan to promote HIT adoption in California. This new role should also include assessing how DMH, MRMIB, and CDCR might incorporate HIT. This advisory body should represent the interests of various stakeholders in the health care community. As noted earlier in this report, CalOHI and CalRHIO have been collaborating on a federally funded project to evaluate the effect of state laws on the development of HIT. CalOHI, which is an office within the California Health and Human Services Agency, should be tasked with leading the ongoing advisory body, which should also include representatives from DMHC, CDI, DHS, DMH, MRMIB, and CDCR. Private-sector members should include CalRHIO, and additional members could be drawn from the Governor’s eHealth Action Forum or from the nonprofit organizations that have shown leadership in HIT. Our discussions with stakeholders indicate that the independence of such a group would be important in encouraging acceptance and participation by private sector stakeholders. We recommend that the Legislature direct the advisory body to include on its agenda, potential future actions the state could take if a voluntary approach to RHIO development proves to be ineffective. Our review indicates that at some point, in the absence of reasonable progress, it could become necessary to take other steps. These could include requiring health care providers to share data with available RHIOs or assessing charges on private health care plans and health insurers in order to finance some of the costs to operate a common health information network. The advisory body should evaluate how long the state should allow the private sector before taking a more proactive role. Remove Possible Statutory Barriers to HIT Adoption. We also recommend that the Legislature direct the new advisory body to review various antikickback and consumer protection laws in California and to recommend any revisions that would be warranted to foster the development of HIT. In considering changes to the law, this review should seek to balance the privacy protections now provided to consumers by existing statute against the consumer benefits that could result from the more widespread use of HIT systems. Our review indicates that there is merit in evaluating and possibly updating some of these laws to reflect new uses of information in HIT systems. As noted previously, Chapter 698 conforms California law to federal eRx rules to accommodate HIT. However, additional technologies and practices could require additional statutory changes. The findings stemming from the joint research project by CalRHIO and CalOHI should provide information on additional ways that the Legislature can revise current statutes for HIT to remove barriers to the development of HIT without undermining appropriate consumer protection laws. In this report, we have outlined basic HIT concepts and how they can work to improve the quality and efficiency of health care in California. Our analysis indicates that various financial and organizational barriers are impeding broader implementation of HIT. Even so, a number of HIE efforts have developed around the country and in California. The results to date indicate that these efforts offer promise to improve the quality of health care and reduce health care costs. The federal government and some state governments have begun to take various steps to further promote such HIE endeavors. We recommend that the Legislature also take steps now to encourage the development and expansion of HIT in California. Figure 4 summarizes our recommendations, which could be implemented individually or as a package. · Establish low-interest loan program to assist Medi-Cal providers with the costs of HIT systems. · Create new Medi-Cal reimbursement policies that compensate providers on a limited-term basis for transitioning to electronic health Records (EHR)-based operations. · Establish grant program to support the development of regional health information organizations in the state. · Set up a contract to provide training opportunities for Medi-Cal practitioners to prepare them for the implementation of HIT in their practices. · Authorize Medi-Cal to negotiate with HIT vendors to obtain discounted prices for Medi-Cal care providers on EHRs that meet selected criteria. · Require the California Public Employees’ Retirement System (CalPERS) to report on its activities to develop EHRs for its members and the costs of requiring health plans that contract with CalPERS to promote the availability of EHRs for their members. · Authorize the California Office of HIPAA Implementation to lead a public-private advisory body to coordinate state HIT policy with health care stakeholders. · Require the new advisory body to recommend changes to state privacy laws and other health care statutes that would remove impediments to HIT adoption while maintaining consumer protections. AHIC (American Health Information Community)-A federally chartered advisory body that provides recommendations to HHS regarding how to make health records electronic and interoperable. AHRQ (U.S. Agency for Healthcare Research and Quality)-An agency within the HHS that operates various research programs aimed at improving the nation’s health care. CalOHI (California Office of HIPAA Implementation)-State body that operates within the California Health and Human Services Agency and is responsible for coordinating the state’s efforts to implement HIPAA. CalPERS (California Public Employees’ Retirement System)-State agency responsible for administering retirement and health benefits for state employees and retirees. CalRHIO (California Regional Health Information Organization)-A nonprofit organization seeking to develop health information exchange and regional health information organizations in California primarily through coordination, research, and education. CCHIT (Certification Commission for Health Information Technology)-A voluntary organization created by three health technology organizations to verify that various health information products meet certain standards. CDCR (California Department of Corrections and Rehabilitation)-State department responsible for operating the state prison system. CDI (California Department of Insurance)-California state department responsible for regulating and overseeing insurance companies. CHCF (California HealthCare Foundation)-An independent philanthropy whose goal is to improve health care delivery and financing in California. CHFFA (California Health Facilities Financing Authority)-Entity within the State Treasurer’s Office that manages several health care financing programs. CMS (Centers for Medicare and Medicaid Services)-Federal agency responsible for administering the Medicare and Medicaid programs. CPOE (Computerized Physician Order Entry)-Clinical health information technology tools that physicians and other providers can use to enter orders, such as prescription drugs or laboratory tests, into a computer system for further patient action. DHS (Department of Health Services)-California state department responsible for administering a variety of public health and health care programs, including management of the Medi-Cal Program. As of July 2007, DHS will split into the Department of Health Care Services and the Department of Public Health. DMH (Department of Mental Health)-California state department responsible for overseeing or providing care for mentally ill children an adults. DMHC (Department of Managed Health Care)-California state department responsible for overseeing and regulating health care service plans. eHI (eHealth Initiative)-A national nonprofit organization whose mission is to improve the quality, safety, and efficiency of health care through information and information technology. EHR (Electronic Health Record)-Electronically stored information about an individual’s health history, treatments, and other related information held by a health care provider. eRx (Electronic Prescribing)-Use of electronic devices to create, process, and communicate prescriptions for medication. GAO (Government Accountability Office)-Nonpartisan Congressional organization responsible for evaluating the programs and expenditures of the federal government. HHS (U.S. Department of Health and Human Services)-Federal agency responsible for administering a wide variety of health programs, including other federal departments such as the Centers for Medicare and Medicaid Services. HIE (Health Information Exchange)-Electronic communication of health information over a network between separate health care entities, such as between a physician’s office and a medical laboratory. HIPAA (Health Information Portability and Accountability Act)-A 1996 federal law that establishes a variety of standards for the security and privacy of health care information. HIT (Health Information Technology)-Any of a variety of information technologies that health care organizations can use to generate, process, and exchange health information during the delivery and administration of health care. Medi-Cal California’s version of the federal Medicaid program, which provides health insurance to low-income persons. ONCHIT (Office of the National Coordinator for Health Information Technology)-An office established within the HHS to oversee the federal government’s policies for promoting health information technology. PHR (Personal Health Record)-Electronically stored information similar to electronic health records but often maintained by an individual and limited to information on the individual’s health conditions and treatment history. RHIO (Regional Health Information Organization)-A group of health care entities in which the members typically establish (1) an electronic network for communicating multiple types of health information using standardized information formats and transmission conventions, and (2) rules governing various aspects of the group’s operation, including financing. SBCCDE (Santa Barbara County Care Data Exchange)-A regional health information organization launched in Santa Barbara County in the late 1990s. VA (U.S. Department of Veterans’ Affairs)-Federal agency responsible for administering a variety of programs for veterans and their families.